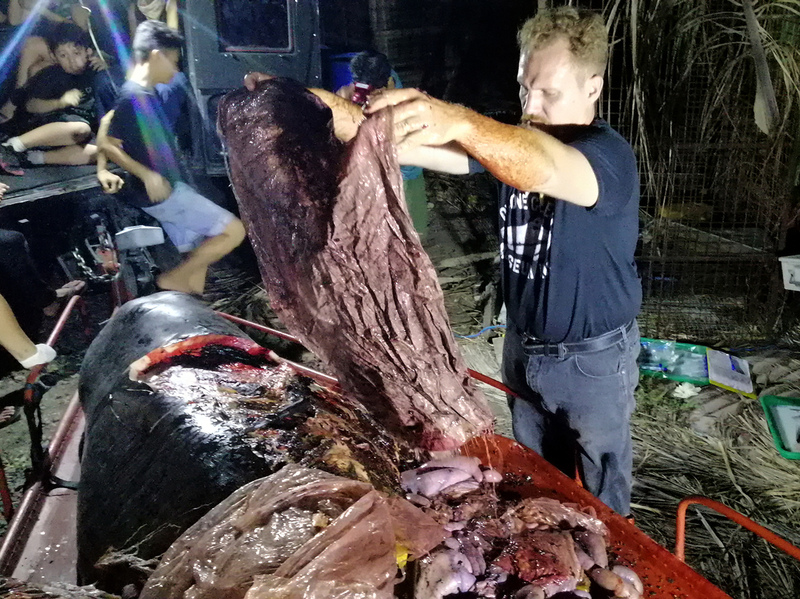 88 Pounds Of Plastic Found In Stomach Of Dead Whale In Philippines In the Philippines, marine biologist Darrell Blatchley recovered the body of a young whale that showed signs of emaciation and dehydration due to the 88 pounds of plastic it had ingested. Darrell Blatchley, environmentalist and director of D' Bone Collector Museum, shows plastic waste found in the stomach of a Cuvier's beaked whale near the Philippine city of Davao. Darrell Blatchley received a call from the Philippines' Bureau of Fisheries and Aquatic Resources early Friday morning reporting that it had a young Cuvier's beaked whale that was weak and vomiting blood. Within a few hours it was dead. Blatchley, a marine biologist and environmentalist based in the Philippine city of Davao, gathered his team to drive two hours to where the whale had washed up. When the necropsy was performed, Blatchley told NPR, he was not prepared for the amount of plastic they found in the whale's stomach. "It was full of plastic — nothing but nonstop plastic," he said. "It was compact to the point that its stomach was literally as hard as a baseball." "That means that this animal has been suffering not for days or weeks but for months or even a year or more," Blatchley added. He noted that among the 88 pounds of plastic were 16 rice sacks — similar to potato sacks — and plastic bags from local Philippine grocery chains, Gaisano Capital and Gaisano grocery outlet. Blatchley is the founder and owner of the D' Bone Collector Museum, a natural history museum in Davao. In the coming days, the museum will post a list of all the items found in the whale's system, the museum said in a post on its Facebook page. Blatchley and his team work with the Bureau of Fisheries and Aquatic Resources and other organizations to assist in rescue and recovery of marine animals. "Within the last 10 years, we have recovered 61 whales and dolphins just within the Davao Gulf," he said. "Of them, 57 have died due to man — whether they ingested plastic or fishing nets or other waste, or gotten caught in pollution — and four were pregnant." In 2019 alone, Blatchley said, he and his team have found three whales or dolphins with plastic waste in their systems. The Philippines has been deemed one of the "world's leading plastic polluters." According to the U.N. Environment Programme, some 9 million tons of plastic end up in the ocean each year. According to a 2017 study from the environmental group Ocean Conservancy, more than half of that waste comes from just five countries in East and Southeast Asia — China, Indonesia, the Philippines, Thailand and Vietnam. The study found that more than half a million metric tons of plastic waste from the Philippines makes it into the ocean each year. Blatchley said he hoped that the latest incident with the Cuvier's beaked whale would launch the issue of plastic pollution in the Philippines, and across the globe, to the forefront. "If we keep going this way, it will be more uncommon to see an animal die of natural causes than it is to see an animal die of plastic," he said.